So many people said you can’t grow trees here, so many times they said you can’t grow that tree, but the trees did. 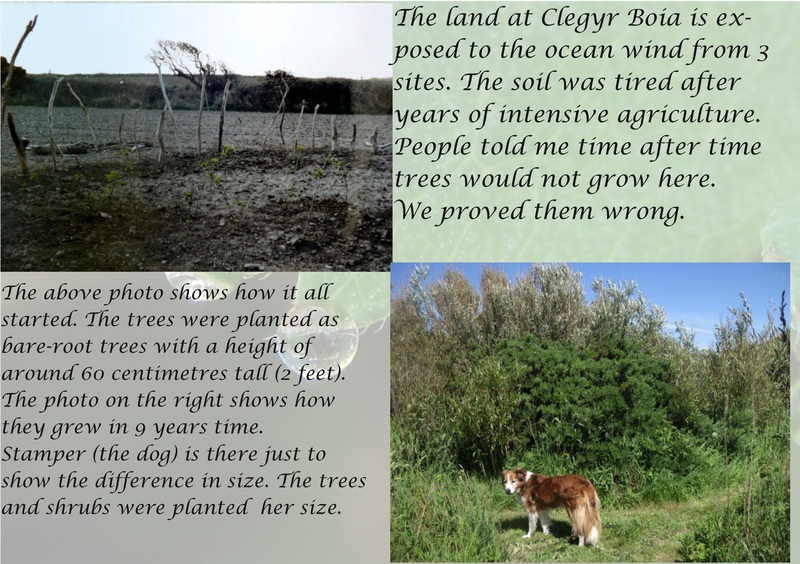 There is still a general notion in Pembrokeshire that you can’t grow trees there. 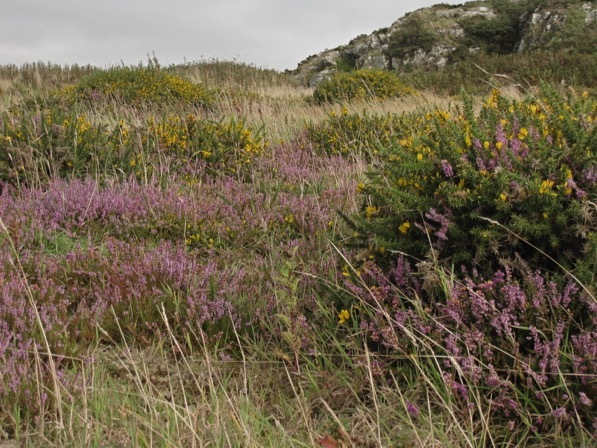 It is even used as an argument in planning regulations of the Pembrokeshire Coast National Park. 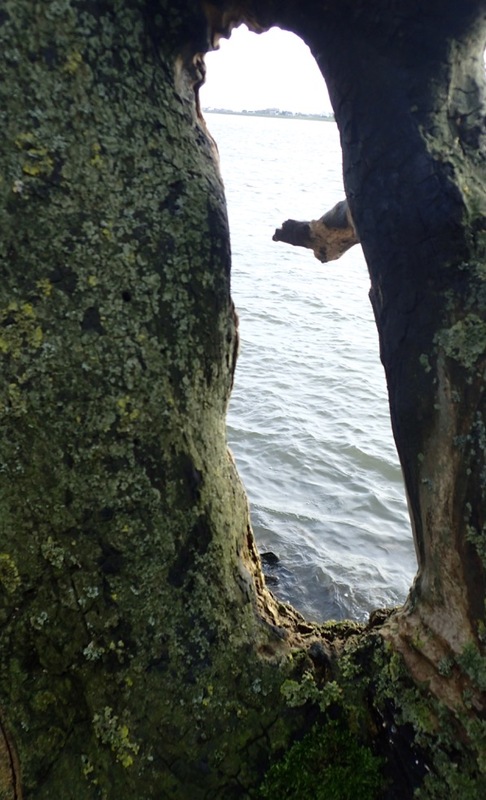 Yet, you will find trees growing all over Pembrokeshire, even right on the coast. The list of trees you can grow in such an exposed area should be limited. After reading lots of books about the subject and looking at the landscape, certain tree came definitely on the list. Others were a pure tryout. The above photo shows a Beech tree (Fagus sylvatica) with an old christmas tree. Both trees planted as a tryout. The Beech was planted in 2003 but it did little to nothing. The X tree was planted in 2005 and suffered but started to grow after just one year. In 2010 the Beech decided to follow and this photo is taken on 11 May 2012 showing both trees healthy and with lots of new growth. The top of the Beech is a bit weak and hangs down, perhaps it was a bit too greedy. So many of the other trees proven them all wrong as well. This Apple tree was planted within a shelter facing south and still today provides lovely Apples. By an old house, which once served as a small country pub, stand some very old Apple trees in the shelter of some Ash trees and Privet (Ligustrum vulgare). The privets were not cut for a long time and became open trees, still providing enough shelter for the Apple trees. Learning from the old the new was planted to grow the same way. On the northern part of the globe it is handy to have the trees sheltered from north and east and facing south. On the southern part you best provide shelter from south, the heath and not the cold. Make a kind of horse shoe shelter with shrubs and trees. So started a new forest thinking which went well beyond the planting of some trees. Maintaining 16 acres of land while involved with other Land Art projects and not to forget bringing up a child is a challenge. Parts of the land had to defend for herself, with some surprising results. 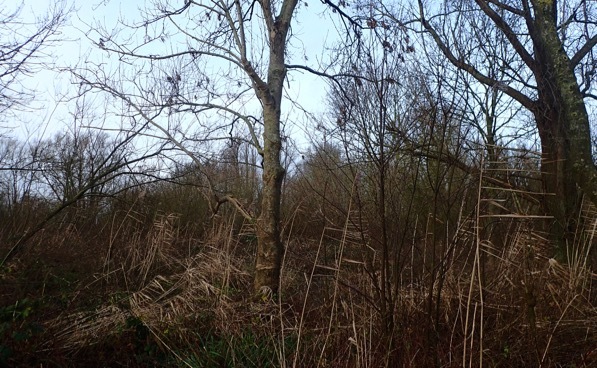 Whenever you go to a blog or website about forestry, you will read about the ‘nasty’ Bramble. A very invasive plant by the looks of it. It literally walks over the land as new shoots grow up at first, then bend down and make new roots for the next step onto the land. You can cut and pull as much as you want but they keep on going on. In the end just a path was kept free by bending the Brambles back. One day while doing a routine check i came across a young tree pushing through the Brambles. The tree was never planted it came on its own and was grown over by the Bramble but this seems to help rather than hinder. There are many trees and plants for that matter which can be called invasive no matter what their nationality is. It is a discussion held on many levels in many places about native and nonnative. 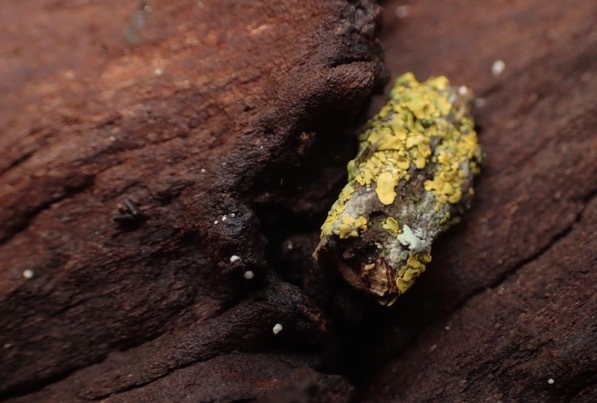 An other blogger is giving lots of information about this discussion to prevent the cutting down of a wonderful forest in the name of nonnative tree forest must be replaced. At times i looked at this issue but did as with all the rest went on and let the trees decide. The native can live and do live happily next to the nonnative when you give them a change. It is my opinion that diversity is more important in a forest than the native only. Perhaps the monoculture has created this issue more than we let on. The Eucalyptus you see here come from that part of Australia which has a similar climate as Pembrokeshire. There are over 700 different Eucalyptus all having their own strength and way to grow. The Eucalyptus on the land are all small Mallee trees, there are even Eucals who don’t grow much bigger than 2 metres (7 feet). This experience will not stop the discussion but the trees have changed my mind about the native nonnative issue. All these lessons have taught me one thing look at the trees in the forests to learn and be surprised. The trees of Land Art Forest will be many of many different kind benefitting the forest each in their own way. Some will be there for fruits and nuts others for their flowers and nectar and other for their amazing looks and some for their wood. This forest you will see because of the trees as they will not be planted in lines of one variety. All forest are made by trees, Land Art Forest will be trees. 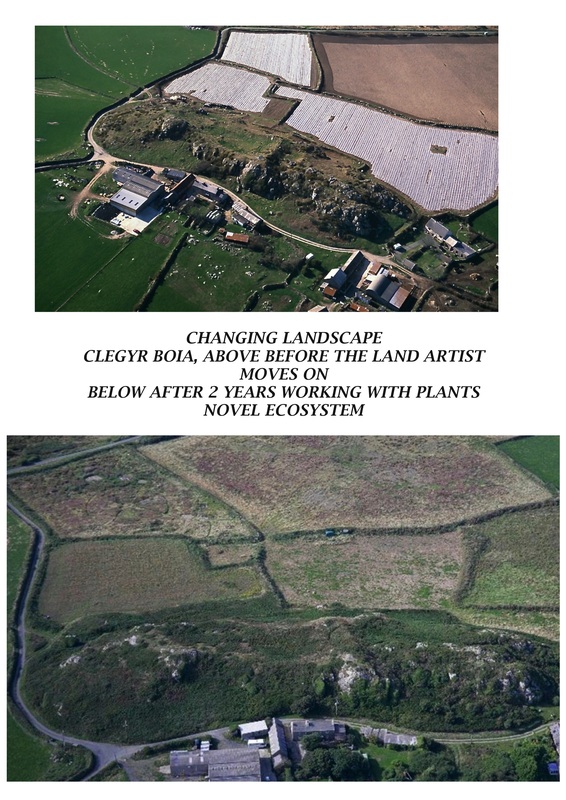 The land art projects on the land at Clegyr Boia, Wales enact an illustration, model for The Land Art Forest. 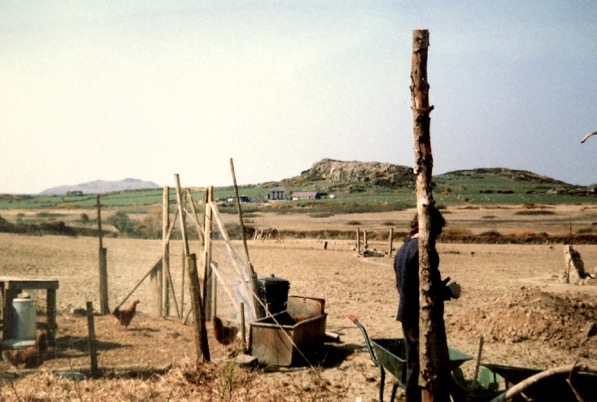 On 25 November 2002 me, doggy Stamper and my chickens moved from The Pumpkin Shed Walled Garden to 6 hectare (16 acres) of land at the foot of Clegyr Boia. Clegyr Boia is a rock which was one of the first settlements in Wales. Farmers had used the land for centuries and the last years in a very intensive way, leaving the soil bare and tired. The above photo shows the land under plastic covering for the growing of early potatoes. Some of that plastic, most likely, is floating around somewhere in the plastic soups of the oceans. The idea behind this project was to create a balance between nature and culture, with Land Art. The best way to describe it would be: ‘recreating nature with culture’. So many people express their doubts, giving me advice, but i had my own ideas. On the small field (photo above) i would experiment with my own ideas. On the other fields i worked together with conservationists. The first year i thought many times, this is never going to work as i discovered how sad the soil was. The land lays on a peninsula exposed to the salty coastal-winds which dried the land out in the summer and in the winter the land stood exposed to rain which washed lots of soil down the drain. I started by creating circles, one large circle in the middle surrounded by 9 smaller circles. Each circle told a story with plants about the surrounding landscape. The whole had an embracing hedge which i planted with bare root shrubs and trees. Many different trees and shrubs were planted to see which one would perform the best under these circumstances. Well, except for one they all survived. The above shows the progress in one circle called Gossamer. In the first year the poor wild roses just hanged in there, 2 years later the lovely driftwood stick had to be placed onto a log to stick her head above the roses. The stones in the middle came all from the land, bucket by bucket i got them while seeding. In 2008 the rocks had to be placed on a high pile to make space for the roses and 4 years later i had to prune the roses to make space for the rocks. If you look closely on the photo you see a small green wheelbarrow filled with heather cuttings. Next to it i stand with a lovely job to chuck the cuttings in the air for random landing. The top field has lots and lots of stones, large and small, all over the soil and in the soil. 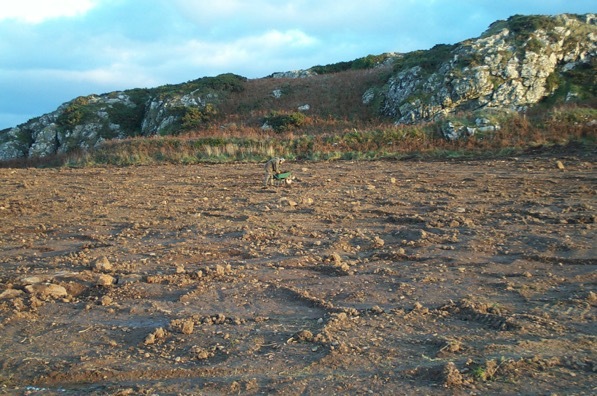 The farmers used to remove the rocks with a machine before seeding, only to plough more up a season later. The field lays on a slope which did help the rain to wash a lot of soil down. Therefore we chose this field to be returned into a heather field. Yes, it was hard work but the result made it all good. This field was created together with the help of conservationists. It shows that we can give back to nature what others took/take away from nature. It is so wonderful to see how a site recovers and how nature enters where it once was forced out. The chemical residue was high, intensive agriculture does not tolerate nature at all and use a large selection of chemicals to spray it out of existence. Yet, it returned in all her glory in not a long time scale and with limited costs. 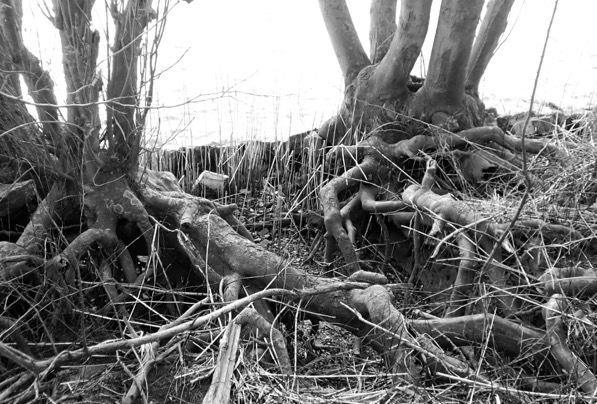 I can tell you so much more about this and i will, the message i want to give here is how nature does recover and how trees grow against all odds. Back to expo thinking, there is no way you can fit a Land Art Forest into a gallery, so forget trying. The exhibition will contain photos, but how and what keeps floating around in my little idea book. Where is clear and the room with walls, doors and windows is clear, but the filling and connecting it to the Land Art Forest ……..
For one expo the photos are selected, the medium is still questionable, only need 5 photos there. These 5 will also be a new card serie. The cards must sell so selection happens in an other way. My more artistic photos do not sell good enough. The expo in Portugal will not be for sale, creating more freedom of artistic expression. Transport is an other issue to consider in the creative progress. Certain ideas dropped of as the small needs to fit inside a suitcase. Printing a photo on a piece of paper feels not good, gives no expressiveness. 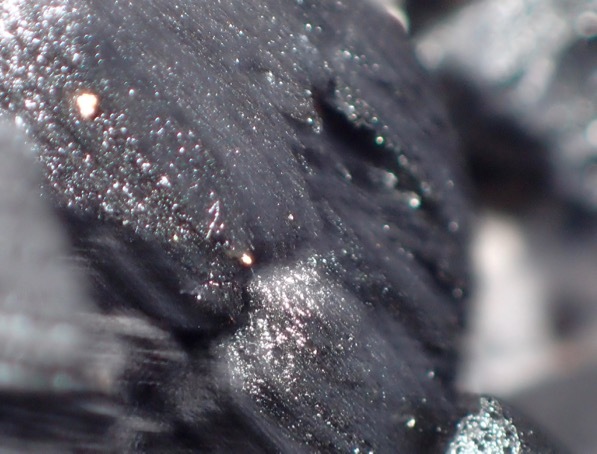 Macro photography seems the opposite of the Land Art Forest of 1 hectare, yet without that small world no forest. It all starts with one drop. How to display the beauty of the small to realise the big as we see so little. Our realities alter constantly, so many medias, so many ways. The budged limits several options, such a pity, the imagination needs no funds but the realisation can’t happen without the dirty word, money. Primeval Forest on our planet is perhaps not existing anymore as we humans have touched every bit of forest. Yet, new primeval forest starts to appear there where humans leave nature alone. A wonderful example is Broadbalk Field by Rothamsted Experimental Station, South England. In 1882 the farmer left a winter wheat field, not even harvested the wheat, alone. The field had to look after itself without any help from humans. Four years later the wheat plants, except for 4, made room for other plants, 40 different plants had moved in, 21 years later 57 ‘wild’ plants were counted. 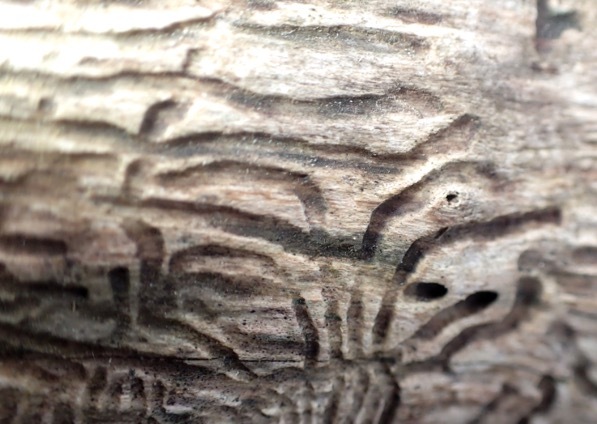 This experiment shows us how nature moves into an area which is just 0.2 hectare. The field had been farmed since 1664 and perhaps even longer and all around are agricultural fields. In 1915 a grove had developed on the land with mainly Oaks, Hazels and Brambles, slowly but certainly the land converted to forest. It became an example for many other areas. Close to where i live, there is a small new primeval river forest. The area has been left alone, meaning has not been managed, people walk and talk here all the time. It is right along the shores of one of the most busy rivers called ‘De Lek’ one of the main routes from the big harbours from Rotterdam to Germany. The forest takes no notice of all the passing boats and just moves in while writing this. It is a damp place to be and all trees need to deal with wet feet, they grow amidst Reed and other water-edge plants. The young trees are all self-seeded and some fall over or are eaten to feed the rest of the trees who still stand. Only a very few trees are old trees all the rest moved in on their own, it is not an ancient forest. Most old forest was gone by 1300 in the Netherlands only a few bits were spared, mainly along the rivers or places harder to make into farmland. Now at many places we turn back time as we move towards an other future by leaving areas to defend for themselves. It shows how nature can recover even after a long time of cultivation. Most of the rivers here were almost dead rivers due to pollution coming not only from own ground but also flowing down stream from Belgium, Germany, France, Switzerland and further afield. The environmentalists made a great difference and the rivers are recovering from the pollution for centuries. There are now strict environmental laws in place preventing pollution as much as it can. We can give back to nature what we once took away. We can speed up the time it takes to recover by playing wind and bird by spreading seeds and planting sticks. All it takes is time and patience. It is wonderful to experience them little surprises.